The Roland Cube-120XL Bass Amp is the flagship Cube XL Bass amp model that is packed with an explosive 120 Watts through a high performance 12-inch coaxial speaker - this Cube means business. This powerful beast is feature-packed, delivering a professional level setup at a price that is much easier for newly gigging players to afford, without having to sacrifice on tonal quality or power. The Roland Cube-120XL Bass features Roland FFP technology - one of their core technologies that is in the DNA of each component, i.e. amp, cabinet, speaker - in order to guarantee maximum efficiency between the amp, cabinet and speaker, which produces the most powerful output possible. At your fingertips is a host of amazing features, including Roland's ground breaking COSM technology. Within the CB-120XL are eight different COSM amp models to choose - including the new Super Low amp, giving you raw sub bass power to play with. There are seven effects to inject into your signal, saving you from having to carry around extra pedals or effects units to gig. The four-band EQ allows you to fine-tune your signal to find the best fit for your bass, your playing environment, and to aid you in nailing down your desired tone. A built-in chromatic tuner means that you'll never have to worry about bringing a tuner with you, and with drop-tuning support included, you can get down to some deep metal tunings with ease. If all that doesn't make you happy, then Roland have even included an on-board looper, which allows you to create beautifully textured layers of sound in real-time, giving you greater versatility as you practise or perform. Surprisingly, the CB-120XL weighs in at under 20kg, making it easily transportable for gigging bassists, and is delightfully compact - something your band mates will appreciate. No matter how small the stage may be, your roaring backline will slot in discreetly. 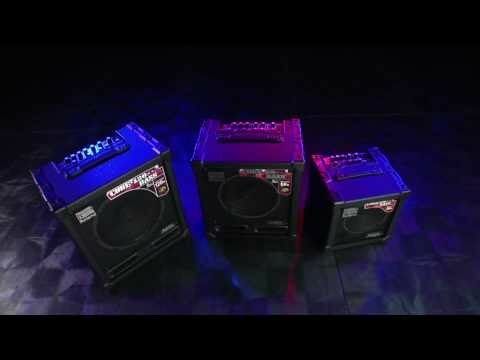 If you're a bassist that is seeking power, versatility, and a road-ready amp that will see you through tour after tour after tour, then look no further than the undeniably awesome Roland Cube-120XL bass amplifier.